Microsoft introduced the Run Script feature way back in ConfigMgr 1706. This feature allows a ConfigMgr administrator to execute a PowerShell script on a system. For a complete review of this feature, see our blog post here: http://www.windowsmanagementexperts.com/configmgr-1706-run-script/configmgr-1706-run-script.htm. I recently wrote a script that will copy or export a host of interesting logs to a file share. This can be helpful in troubleshooting device issues, or just gathering logs for any purpose that you may find. I’ll go through setting up the file share, and provide details as to what the script captures. The script is available for download at the bottom. First, we must set up a file share to copy the logs too. 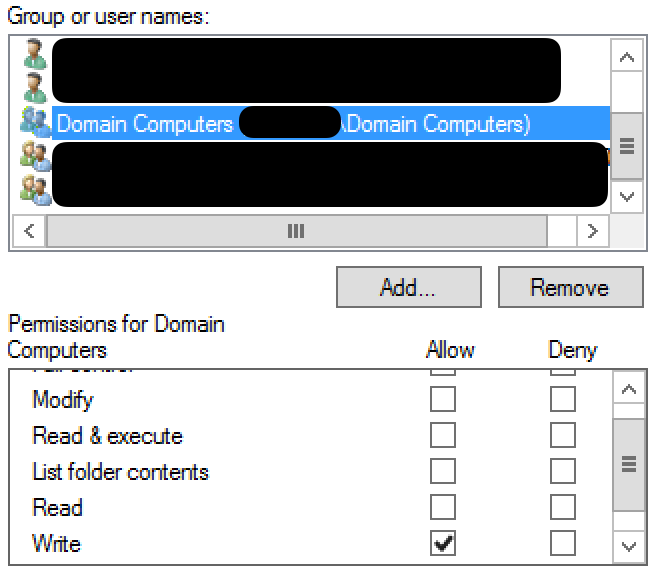 I suggest creating a share (it can be on any Windows server) and giving your Domain Computers group write access only. Because the script executes as the system account, it will perform the copy as the computer’s computer object. By granting write access only, you prevent other computer objects or users from accessing these files. You will of course have to grant yourself, or a group of users read access to be able to retrieve the files. I would suggest making this a hidden share. The script itself is pretty simple, and you can add to it if you want. It will copy the files into a folder that is formatted like <computer name>-<date>. Just change the first part of line 2 to reflect the file share. Copies the Windows Update log.